The Cross, my Coca Cola Kitchen, and the Pizza Delivery Guy | Lift Jesus' Cross! Posted on April 4, 2015	by Lift the Cross of Jesus! I saw the Coca Cola Kitchen in my mind’s eye the day we made the deal to buy our house. 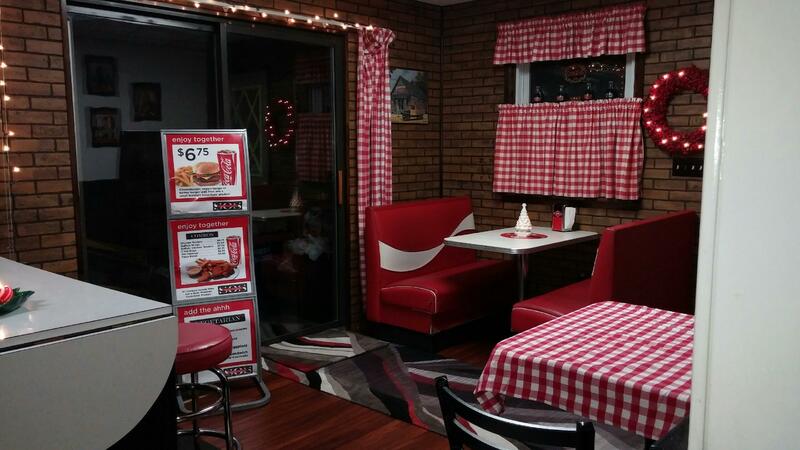 The carpeted dining room and large table would be replaced with shiny dark wooden floors and Coca Cola booths. The ugly brown paneled walls (sorry, you can’t see them in the picture) would be painted white on top, black on bottom, and the kitchen floor black and white checkered tile. The fact is, I always wanted a red kitchen. Ten years later, January 2015, my sister found coca cola benches at an online auction. I was glad she persuaded me to buy the benches, two tables, four chairs, and a couple signs for less than $200. What do you think? You know who’s impressed the most with our Coca Cola kitchen? The pizza delivery guys! (No offense against the gals, but we always get guys delivering pizza here). We’ve ordered pizza delivery a few times since January, and each time one of the delivery guys steps into the kitchen, his jaw drops. (I guess you could call our kitchen a conversation piece). This week was no exception. Earlier this week the 20-something pizza delivery guy came inside the kitchen with his boxes. He looked at the portraits of our seven children on the wall. (I made all of them dress up in red, black, and white for the photos so they’d match my kitchen! Haha!) He noticed our Burmese daughters and was curious. I told them their story–they left Burma because the military government persecuted all Christians and attacked Christian villages. Justin and I talked for 15 minutes. The conversation went like this. I nodded and let him talk. Justin sounded just like all the other kids his age who’ve talked to me. He said he wants the truth and he won’t stop and believe something just because someone wants him to do that. He has to know the truth. I shared the gospel throughout our conversation and told Justin that I believe the Bible, front to back, and that is my source of truth. Now he nodded, like he’d heard that before. So I added, “You know, the Bible has been proven to be true and factual.” That impressed him a little. Later in the conversation I asked Justin if he wanted to give His life to Jesus as his Savior–he could do it now. He hesitated, in thought. He needed time to think about it. I could only throw the lifeline, I couldn’t make him grab it. His choice. Hopefully, another “lifeboat” will come his way during his life and Justin will grab it and be saved. I hope so. I pray so. The cross. May everything in my life point to it. Earlier this month I got to thinking about sinners in a lost sea. The truth is, people are going to hell. We have the lifeline. We have the cross . . . The lifeboat that I’m in. Lift the cross up at the helm! And float me straight to Him. ‘Til faith becomes our sight! Look up at the helm, the cross! Look and LIVE my friend! This entry was posted in Uncategorized and tagged Bible true, cross, hell, how to get to heaven, is hell real, lifeboat. Bookmark the permalink. Again, I wrote a whole essay in response and erased it – then again. I’m really must be going. The Bible, though a source of great life lessons, spirituality, forgiveness and salvation. It is also one of the most misunderstood and misinterpreted books. In short, I’m certainly glad that God sent Jesus to take our place on a cross so we don’t spend eternity in hell. Who on this Earth really knows? Excellent, Hope! Thanks for sharing!